Left Image: Cover of Newsweek depicting unflattering image of Oprah as a witch. Courtesy of Newsweek. To make matters worse, all print media is suffering from declining readership, a casualty of the Internet Revolution. According to the LA Times, Newsweek is starving along with the rest of the print media, with declining readership and declining ad revenue. Rather than ponder ethical standards, a starving homeless man will smash and grab the loaf of bread in the bakery window. It’s the same for Newsweek, a magazine described as “an infomercial masquerading as medical news” and “an example of corruption in journalism”. Five national consumer organizations have complained about Newsweek. They have charged Newsweek magazine with unethical journalism in the promotion of the drug industry’s agenda. Specifically, Newsweek ran a special edition, entitled Health for Life, paid for by the drug industry’s PhRMA. Newsweek promotes a biased drug agenda, all the while pretending to be impartial and objective. This is truely deceptive. Above left image: Where’s the Bread, Man? With a personal fortune of 2.7 billion, and 40 million weekly viewers, Oprah Winfrey is immensely popular. Her O magazine sells 2 million copies a month and her new cable television channel will reach 70 million homes. Left Image: A more flattering image of Oprah Winfrey courtesy of the Oprah web site. Why is Oprah so popular? I suggest it is because Oprah is a champion of the interests of the people. In this case she has championed Natural Medicine and Bioidentical Hormones, topics which are immensely popular with the public. 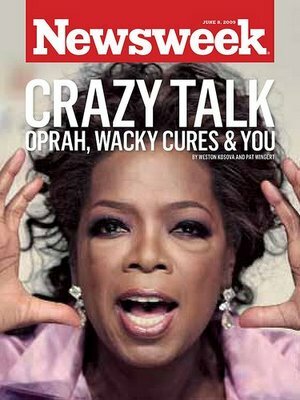 Is Oprah hurt or concerned about the photo on the Newsweek Cover? In this new day of viral marketing, any publicity is good publicity, including this Newsweek hatchet job article. I suspect Oprah is laughting all the way to the bank. Left Image: Suzanne Somers arch-enemy of the synthetic hormone drug company, Wyeth. Her books on bioidentical hormones have cost the Drug Industry millions of dollars in lost revenue. Image Courtesy of Suzanne Somers Blog. Just Another Misinformation Campaign in a Medical Information War Between Natural Medicine and Big Pharma. 1) Newsweek says: “bioidentical hormones are unregulated”. This is an outright falsehood. Compounded bioidentical hormones are highly regulated at all levels. Just walk into a pharmacy and ask the pharmacist in charge about the regulations. There are literally hundreds of them. They are regulated up the Wazoo from start to finish at county, state and federal levels. And yes, bio-identical hormones ARE FDA approved. The Newsweek deception is this: Newsweek says that there is no FDA approval for Compounded hormones. Yes this is correct. That’s because compounding is not required to be FDA approved. Instead, compounding is regulated by other state and local agencies. This is another outright falsehood. Menopause is characterized by hormone deficiency, and this is the absolute truth proven by lab tests I see every day. This idea has not been discredited. Well, maybe Newsweek wants the public to think so. 3) Newsweek says: “Hormone therapy can increase a woman’s risk of heart attacks, strokes, blood clots and cancer”. Here we see a typical switch tactic by Newsweek. Newsweek is attempting to confuse the public about two very different types of hormones. Synthetic hormones are the monster hormones. Bio-identical hormones are the good ones that I recommend. Yes, Newsweek is correct that synthetic monster hormones (such as Provera) are associated with cancer and heart disease. However, Newsweek has not told the public the truth, that bio-identical hormones are safe and are not associated with increased risk of cancer or heart disease. Obviously that would displease their drug industry masters. Number two, Newsweek is trying to confuse the public into believing that synthetic chemically altered hormones (provera) are the same as bioidentical hormones. They are not. Synthetic means chemically altered, and this creates a monster hormone causing cancer and heart disease. Bio-identical Hormones are not chemically altered. They are identical to the hormones in the human body. The medical literature is replete with studies showing that bioidentical hormones are safe and effective, while, on the other hand, the chemically altered synthetic hormones are monsters and should never have been approved for human use. Newsweek is wrong again. Hot flashes are only one of many symptoms of estrogen deficiency, Other symptoms include vaginal dryness, sweats, difficulty sleeping, cognitive dysfunction, menopausal arthritis etc. These are all valid symptoms and good reasons for prescribing bioidentical hormones. 5) This Newsweek article also provided misinformation about iodine suplementation, an essential mineral added to table salt since 1924. Supplementation with Iodine is safe and beneficial for health, and highly recommended. See my article on Iodine Supplementation and Breast Cancer Prevention. Above quoted from Jake Crosby. Pat Wingert, the co-writer of the Oprah-bashing Newsweek Article, also co-authored a book on menopause entitled, “Is it Hot in Here? Or is it me? The Complete Guide to Menopause” available on Amazon. This book advocates synthetic hormones and promotes a drug company agenda. Left Image Pat Wingert. Right Image Pat’s book cover. Courtesy of Newsweek and Pat Wingert. “I have been dealing with menopause for several years and this book in no way, shape or form helped me to find a cure for my symptoms. But then again why would I buy a book written by journalists about medical conditions?!?! And as a side, I have found that bio-identical hormones are the ONLY therapy that has saved my life, instead of “possibly” risking my life by taking synthetic hormones. Get this book off the market! Where to Go For Medical Advice? Turn to these Medical Heroes. Rather than get your medical advice from a light-weight tabloid journalist like Pat Wingert, who promotes a biased drug company agenda, I recommend Erika Schwartz MD, Kent Holtorf MD, and David Brownstein MD, three medical heroes with active bioidentical hormone practices. Erika’s comments about the Newsweek Oprah bashing article can be found here. Left Above Image: Erika Schwartz MD, medical director of busy bioidentical hormone practice in Manhattan New York. Erika Schwartz MD and Kent Holtorf MD Say BioIdentical Hormones are Safe and Effective. Kent Holtorf MD published a review article entitled, the Bioidentical Hormone Debate in Postraduate Medicine citing 196 medial studies showing bioidentical hromones are safer and more effetive than synthetics. Left Image: Kent Holtorf MD, medical driector of busy bioidentical hormone practice in Califiornia. Rather than rely on Pat Wingert’s Newsweek propaganda for the Drug Industry, you may want to read this recent Wall Street Journal article on bioidentical hormones, written by ERIKA SCHWARTZ MD , KENT HOLTORF MD, and DAVID BROWNSTEIN MD. Above left image: David Brownstein MD, medical director of busy bioidentical hormone practice in Michigan. Left Image: Courtesy of CW Randolph MD. CW Randolph MD is director of the Natural Hormone Institute of America and runs a busy bioidentical hormone practivce in Jacksonville Florida. Bioidentical Hormone Replacement Is REAL Medical Science, Not Entertainment Medicine by C.W. Randolph, Jr., M.D., Medical Director of the Natural Hormone Institute. Newsweek decides to go the other way–withholding information seems the point. Reading this Newsweek article, you’d think there was really no difference between the synthetic hormones provided by drug companies and the bio-identical hormones that many doctors prescribe, but which are not produced by major drug companies. “They are actually synthetic, just like conventional hormones.” Hardly. Yes, they are both “man-made,” but the bioidenticals are created to have the same molecular structure as our own hormones. Synthetic are not, it’s a one size fits all approach that leaves many women with uncomfortable side effects. The bioidentical process is quite arduous, and requires lots of testing, but each woman gets a regimen much more suited to her body. Was anybody troubled by the glib disclosure that Newsweek correspondent Pat Wingert, who worked on this article, wrote a book on menopause? Excuse me? Talk about a dog in the fight! I imagine she can’t be a big fan of bioidentical hormones in her book. Pat Wingert. Coming to Newsweek after a nine-year journalism career in Chicago, Wingert had worked as a reporter for The Chicago Tribune from 1985 to 1986 and The Chicago Sun-Times from 1977 to 1984. While working at the Sun-Times, she worked as legman to Chicago’s legendary Pulitzer-Prize winning columnist, Mike Royko. A Chicago native, Wingert received a B.S. in journalism from the University of Illinois, Champaign-Urbana. She resides in Washington D.C. with her husband Brian Kelly, the executive editor of U.S. News magazine, and their three children. Newsweek May Stop Weekly Circulation January 17 2009 Battered by a one-two punch of declining readership and ad pages, Newsweek magazine is getting an extreme makeover this year that will include a large circulation reduction, deep cuts in operating costs, and a new effort to attract advertisers by concentrating on an elite audience. You Go, Oprah! by Jeanne Supin , But the real secret is Oprah remains steadfastly relevant, and Newsweek does not. Unfortunately at a time when we most benefit from national dialog, Newsweek chooses to be a gasping periodical in a dying industry, regurgitating the same empty story week-after-week, with writers and editors — no matter how skilled and well-intentioned — increasingly talking only to the shrinking pool of people just like themselves. ..There’s a whole new world out here, far larger than Newsweek’s antiquated universe. Maybe if they took some bioidentical hormones they’d finally feel well enough to find it, join it, and share that story. Two Scariest Women on the Planet – Oprah and Suzanne by Suzanne Somers 6/4/2009 Have you seen this week’s Newsweek magazine? Here we go again! They have a new article on how Oprah is giving “dangerous” advice by having uninformed guests give false information to the public. First of all, how dare they alter Oprah’s image for that cover! It’s out of focus, and they have obviously added bags and shadowing under her eyes to make her look crazed and scary. Conclusion: Physiological data and clinical outcomes demonstrate that bioidentical hormones are associated with lower risks, including the risk of breast cancer and cardiovascular disease, and are more efficacious than their synthetic and animalderived counterparts. Until evidence is found to the contrary, bioidentical hormones remain the preferred method of HRT. Further randomized controlled trials are needed to delineate these differences more clearly. Tagged bioidentical hormone replacement therapy, estrogen, premarin. Bookmark the permalink.